We think we know the story of Wolfgang Amadeus Mozart’s life, Austrian-born to a tyrannical father who worked him fiercely; unhappily married to a spendthrift woman; a child-like character ill at ease amid the aristocratic splendor of the Viennese court; a musical genius who died young thus depriving the world of future glories. Yet only that last point is true. From his early days as a child prodigy performing for the imperial royal family in Vienna to the last months of his short life, driven to exhaustion by a punitive workload, one thing remained constant: his happy disposition. 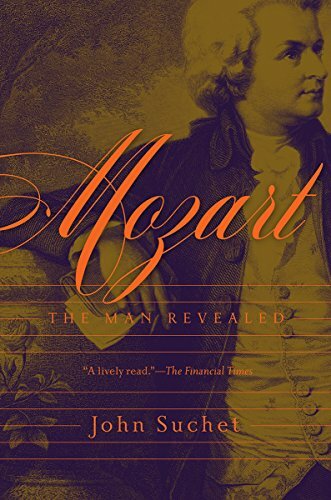 Mozart: The Man Revealed by John Suchet is a wide-ranging biography that studies the many legends and misinterpretations surrounding one of the most beloved and revered musical composers of all time. Suchet presents Classic FM's flagship morning program in London, England; the UK’s only pure classical music radio station has broadcast since September 1992 and has brought classical music to millions of people. Before turning to classical music, Suchet was one of England’s most esteemed television journalists. He is the author of numerous bestselling music composer biographies, including Beethoven: The Man Revealed (2012, Elliott & Thompson). In this splendidly written and beautifully illustrated coffee book-style offering Suchet examines and celebrates the trials and tribulations, grand successes and disheartening setbacks of the real Mozart; a man that was blessed with an abundance of talent yet from time to time struggled financially to make ends meet and suffered from bouts of depression. Mozart’s simple yet naughty sense of humor and naturally mischievous personality balanced his God given abilities; these were attributes that never left him in his 35 short years. Mozart’s music has continued to bring joy and comfort to countless generations for the past 200+ years; his life, though brief, is no less fascinating. This captivating story will sweep the reader through fascinating and glowing accounts of the great composer’s life, and while the author’s love of the subject matter is plainly evident he does not shy away from examining the difficult aspects of Mozart's personality. This book will make a wonderful addition to anyone’s library and is a must read for music lovers of all kinds.